•	APT FOR LARGE BREED PUPPIES- Royal Canin Maxi Junior Puppy Food is a diet apt for Large Breed Puppies up to 15 months (Adult Weight 26-44 Kg), who have a long growth period. 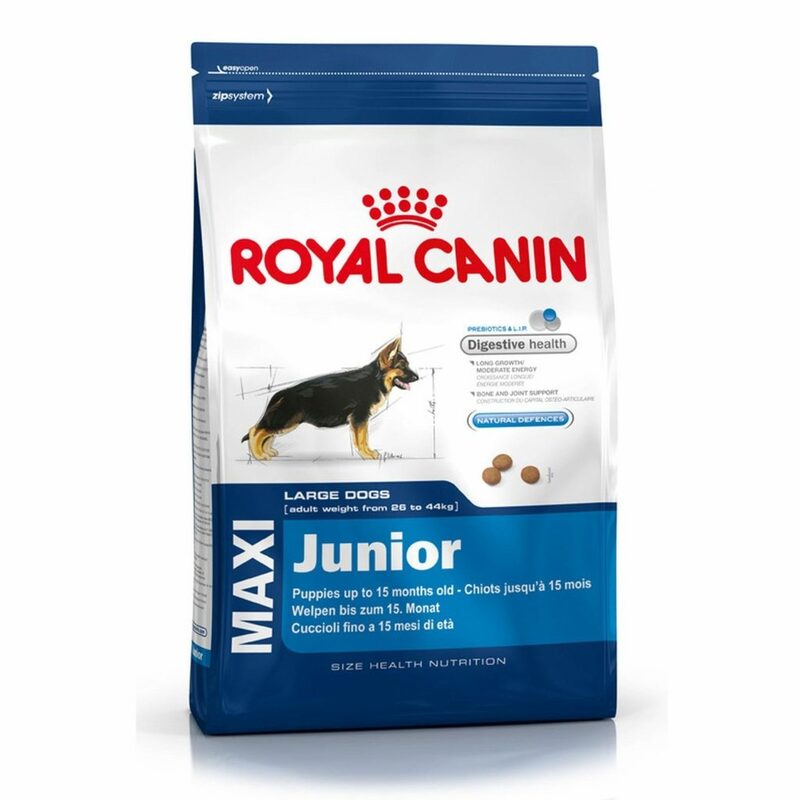 •	ENHANCES B1 STRUCTURE- Royal Canin Maxi Junior Puppy Food is high in nutritional value that enhances B1 Structure and improves bone strength to promotes the healthy development of Puppies. •	MAINTAINS ENERGY LEVEL- Royal Canin Maxi Junior Puppy meets the moderate energy needs of Large Breed Puppies who have a long growth period. •	SUPPORTS GOOD DENTAL HEALTH- Royal Canin Maxi Junior Puppy Food is a proven Kibble Technology that reduces the formation of tartar and supports good dental health of puppies. •	IMPROVES SKIN & COAT- RC Maxi Junior Puppy contains ideal levels of EPA-DHA that helps in improving Skin and Coat of puppies. PROMOTES GROWTH- This food formula is designed to meet the specific needs of Large Breed Puppies that promotes growth throughout every stage of their life. Royal Canin Maxi Junior Puppy Food is a diet apt for Large Breed Puppies up to 15 months, who weight 26-44 Kgs when they are Adult. This Food contains such a formula that helps in enhancing B1 structure of puppies that ultimately improves Bones’ Strength to promotes better development. Royal Canin Maxi Junior Puppy Food meets the moderate energy needs of Large Breed Puppies, who have a long growth period. It also contains an apt amount of EPA-DHA that helps in improving Skin & Coat of these puppies. Royal Canin Maxi Junior Puppy Food is a proven Kibble Technology that reduces the formation of tartar and maintains the dental health of growing puppies.